Well, we were back to summer for today. Very wacky. 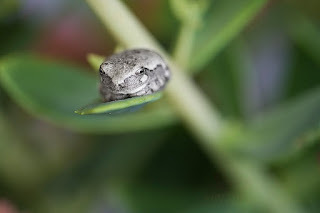 I captured this little frog last week. I saw it sitting on the Sedum one afternoon. It looked very silver against the blooms. By the time I got my camera it had moved to sit on a leaf. It was very tiny, less than an inch and from the side had a bit more color. I thought it was pretty cute but have no idea what type it is.